In this recording, you'll learn to overcome common fears about approaching the topic of suicidal ideation with clients, and learn creative and compassionate techniques to deeply, warmly, and safely guide your clients through the dark places and back into the light. You’ll feel transformed in the way you think about suicidal clients, and the way you think about yourself as a helping professional and human being. Discover how to decrease clients’ sense of isolation, and effectively utilize innovative techniques to restore hope. Role playing and hands-on exercises will give you the opportunity to practice new strategies in a safe, supportive environment. Leave this recording with a new confidence and creative skills to help people move from the dark, lonely, meaningless place into a place of hope, purpose, and connection with fellow human beings! Articulate how suicidal thoughts are related to the universal human concerns of isolation and meaninglessness. Apply and practice the therapeutic factors that lead to hope and change in suicidal individuals. 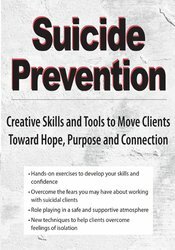 Reduce anxiety and increase self-confidence in engaging with suicidal individuals and talking about suicidal thoughts. Develop and practice creative, experiential approaches including the use of Gestalt techniques, music, and narrative therapy to help individuals move from despair to hopefulness. Implement group therapy and effectively timed professional self-disclosure as powerful tools for transforming a suicidal individual’s perceptions of self and the world. Examine the way you think about yourself as a professional and a human being; change the way you think about suicidal individuals. A sense of belonging: what decreases suicidal ideation and hopelessness? Dr. Nancy K. Farber, is a licensed clinical psychologist, school counselor, and veteran professor of school, community, and clinical counseling. She is a humanistic psychologist who is known for her lively, musical, experiential teaching style. She has served as an associate professor at Eastern Illinois University and a supervising psychologist at Torrance State Hospital where she worked intensively with suicidal clients both in groups and individually, and trained psychology doctoral interns. Dr. Farber specializes in group psychotherapy and has worked at university counseling centers across the country including Purdue University, Illinois State University, Bowling Green State University, and Ball State University. She works as a psychotherapist in private practice in Hershey and Palmyra, PA.
Dr. Farber is also a published researcher and author who has written articles for referred journals and presented both research and training workshops at the American Psychological Association, American School Counselor Association, Illinois Counseling Association, and Pennsylvania Psychological Association. Dr. Farber holds a Ph.D. in counseling psychology from Ball State University, an MS.Ed. in psychological services from the University of Pennsylvania, and a B.S. in communication arts from Cornell University. She also holds a B.A. in music from Lebanon Valley College. Financial: Nancy Farber maintains a private practice. She receives a speaking honorarium from PESI, Inc. Non-financial: Nancy Farber has no relevant non-financial relationship to disclose.